﻿International Left-Handers Day: Calendar, History, Tweets, Facts & Activities. 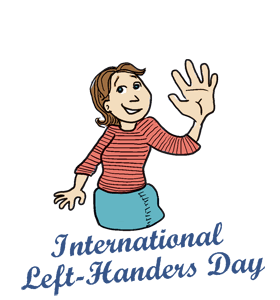 International Left-Handers Day is a day to bring attention to the struggles which lefties face daily in a right-handed society. August 13th is observed as International Left-Handers Day. 10% of people are left-handed according to a report by Scientific American. Geniuses are more likely to be left-handed - 20% of the top scoring SAT takers are left-handed. In 2013, 31% of Major League Baseball pitchers are left-handed. Of the last 6 Presidents, 3 were lefties - Obama, Clinton and Bush Sr.
Eat with your left hand today. Attempt to use only your left hand while writing today. If typing or navigating on a computer, use the mouse with your left hand. Look around you and notice how many people you know are left-handed. Attempt to cook using your left-hand as the primary one. Create a Lefty Zone where everyone who enters must only use their left hand for the day.